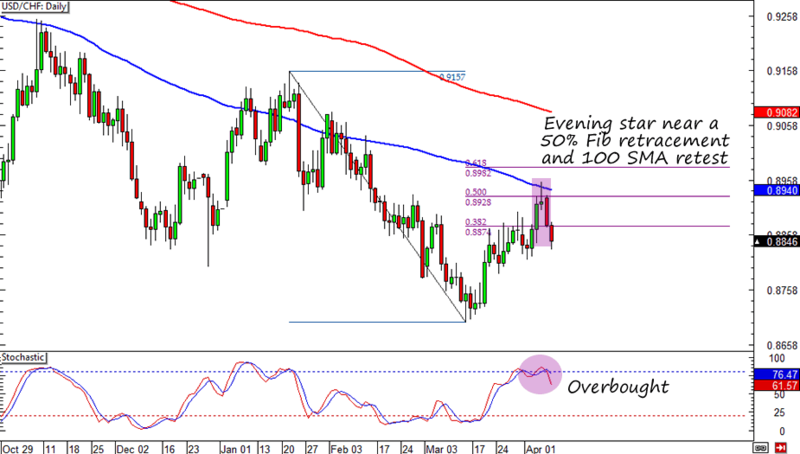 A couple of days ago Big Pippin pointed out an evening star on USD/CHF’s daily chart. I paid close attention to it because price was had also bounced from my favorite 100 SMA and it looked like the 50% Fib retracement level was also holding. On the fundamental side I noticed that the dollar wasn’t gettin’ any love from the bulls despite a not-so-bad NFP report. In fact, investors even used the report’s release to sell the dollar like there’s no tomorrow. USD/JPY took the biggest hit but USD/CHF was in a better place for a short. As I mentioned on my Twitter account, I risked 0.5% and entered at market (.8867) as soon as I saw the evening star pattern. I placed my stop loss 150 pips away, which is already above the 50% Fib, 100 SMA, and last week’s high. Meanwhile, my initial profit target is right at .8700, the pair’s recent low. What do you think of this setup? Anybody here still shorting the dollar?